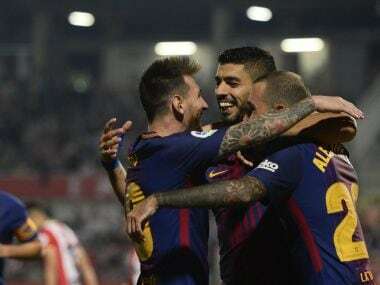 Madrid: Barcelona maintained their perfect start to La Liga with a sixth straight win as Luis Suarez and two own goals secured a 3-0 win at Girona in a match laced with political tension on Saturday. Real Madrid remain seven points behind Barca thanks to Dani Ceballos's double on his full debut to bounce back from a shock midweek defeat by Real Betis with a 2-1 win at Alaves on Saturday to move up to fourth. Girona were hosting Barca in a Catalan derby for the first time in the top flight, but a one-sided game on the field was marked by persistent chants in favour of independence for Catalonia. Catalonia's pro-separatist president Carles Puigdemont was in attendance, whilst the pro-independence Estelada flag was waved by sections of both supports. 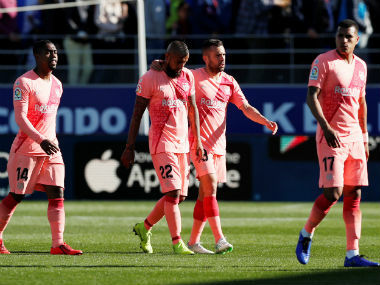 "The game had its difficulties," said Barca boss Ernesto Valverde. "It's a derby, there was a great atmosphere, tension. It is normal, but we played well." 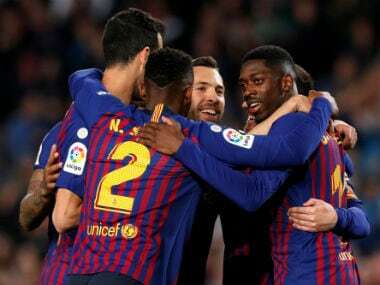 On the field there was much less controversy as Barca were rarely troubled after Aday Benitez turned Jordi Alba's wayward shot into his own net after just 17 minutes. Another own goal extended their advantage three minutes after half-time when goalkeeper Gorka Iraizoz was fooled by Suarez's dummy from Aleix Vidal's cross. And Suarez rounded off the scoring himself with just his second goal of the season by whipping the ball into Iraizoz's near post from Sergi Roberto's pass over the top. At Mendizorroza, Madrid were once again wasteful in front of goal, but still sneaked by an Alaves side that remain without a point after six games. "Today we needed the three points. We are not in brilliant form, but for sure we will play better on other days," said Real boss Zinedine Zidane. Ceballos was one of three changes made to the side that lost to Betis by Zidane as Luka Modric and Gareth Bale were left on the bench ahead of Tuesday's Champions League trip to Borussia Dortmund. And the Spanish under-21 international settled Madrid's nerves after just 10 minutes as he caught Fernando Pacheco flat-footed. Alaves did register their first goal of the season five minutes before half-time when Manu Garcia met Munir El Haddadi's cross flush to power a header into the top corner. Madrid retook the lead just three minutes later, though, as Ceballos pounced on a poor punch from Pacheco to fire into the bottom corner. Yet, Alaves could also have snatched a first point of the season as Alfonso Pedraza's deflected effort hit the bar before Pedraza struck the post when clean through on goal. "When you go away having only scored two goals for the chances we had it isn't a lot," added Zidane. 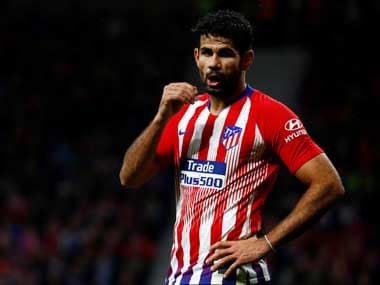 Costa won't be able to feature until January after completing his prolonged return to the club from Chelsea for a reported club record fee of 55 million euros ($66 million), plus 10 million euros in add-ons. 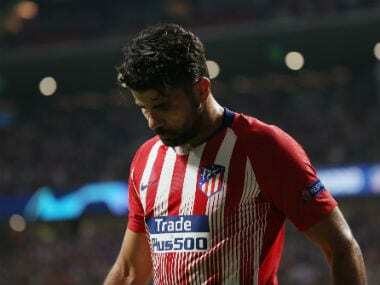 "We are happy that a player of his stature wants to come to Atletico Madrid," Atletico boss Diego Simeone said of Costa's return. Filipe Luis smashed the underside of the bar with Atletico's best effort of a first half short on clear-cut chances. But it took less than a minute of the second period to break the deadlock when Carrasco showed great awareness and pace to latch onto a short back pass from Steven N'Zonzi to beat Sergio Rico to the ball, round the keeper and slot into an empty net.